Photos of Similar UFOs Taken From Widely Separate Locations! We now have three photographs and two videos of an unusual object which has very recently been noticed in the sky from distantly separated locations. Two come from different areas of the U.S., and one comes from Mexico. The similar shape of these objects is obvious. The photographs from Virgie, KY, and Gardiner, NY, clearly appear to be photos of the same object but taken on different days from widely separate locations. In both instances, the object was observed to be stationary, implying that the object utilizes energy to maintain its position in 3-D space. Will everyone please keep looking up and have a camera ready. 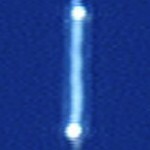 If this object, whatever it is, keeps showing up at various locations around the world then this needs to be documented! 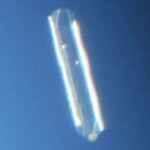 Photo of bright, reflective cylindrical object photographed by amateur astronomer Allen Epling on October 16, 2012 over Virgie, Kentucky. 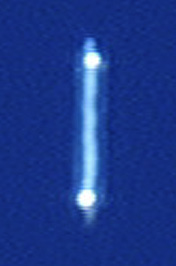 Bright, reflective, translucent cylindrical object seen over Gardiner, New York on October 18, 2012. Photograph taken by experienced pilot Bill Richards. 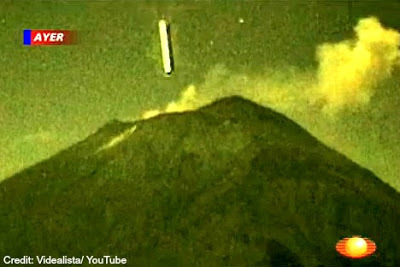 Still photo taken from video of a large, bright, cylindrical object which appeared to enter the Popocatepetl volcano in Mexico on October 25, 2012. In my opinion the edges of the object which appears to be entering the volcano are too well-defined for this to be a meteor, there is no meteor “tail”, and I do not believe this represents a “glitch” in the video. 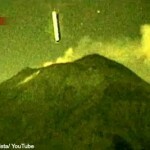 This is an object which is either entering the mouth of the volcano or is descending behind the volcano. My thanks to Linda Moulton Howe at www.Earthfiles.com for bringing the Virgie, KY, and Gardiner, NY, photos and their background information to the world’s attention. Her reports on these two incidents can be accessed HERE and HERE. Also, thanks to Red Collie (aka Dr. Horace Drew) for his heads-up regarding the similarities of these three sightings. In trying to view your video of the UFO over Popocatepetl, I was frustrated to see that it had been removed “due to multiple third party notifications of copyright infringement.” I note that many, or most, of the videos I try to view on this site result only in error messages. I am admittedly employing a funky old computer, but I must wonder whether or not you have recently reviewed the availability of the videos you post, and whether or not you perceive any sort of anomalous interference with your site. If you do perceive this to be the case, perhaps you would share this perception with your visitors. I received the same message with that video. I will take down that video and see if I can locate another. Unfortunately I have no control over how YouTube handles these videos, and I do not often go back to review these posts as frequently as I should. Thanks for your notification.